Review of Drie Fonteinen Oude Kriek | Beer Apprentice - Craft Beer News, Reviews, Interviews and Info. What’s up guys? Everything going alright? I hope so. Well, for today’s craft beer review I’m going to be trying a beer from the Brouwerij Drie Fonteinen out of Beersel, Belgium called Oude Kriek. I personally think Mr. Armand Debelder is a genius, so to have the opportunity to try the Oude Kriek is very, very exciting to say the least. I found this short description of the brew on the website, 3fonteinen.be. Oude Kriek 3 Fountains caused by ripening cherries (both the pulp and the seeds) in young Lambic. This process takes between 6 to 8 months after bottling the beer matures for at least four months in a warm room where the spontaneous fermentation occurs in the bottle. I can’t wait any longer. Let’s give it a go. The beer came in a 12.7 oz. bottle and it had an ABV of 6.0%. It poured a deep reddish to cranberry juice color. A light pink head with an ok size was formed from a very gentle pour. It was somewhat sudsy and fizzy. The retention time was slight and the lacing lacked a touch as well. The bouquet was remarkable. Beautifully soured cherries blended near perfectly with tones of oak and earth. As I studied the fruitiness a bit more I also began to pick up on hints of strawberry and raspberry. Very nice. A tiny bit of acidity was found, however a very well balanced funk helped pull it all together. Wow. This had one of the better fragrances that I’ve smelled in quite some time. The flavor was really nice too. A manageable sourness of cherries and ripe strawberries started it off. A kiss of vinegar, light funkiness and a medium strength tartness quickly followed. The oak fell inline at the back end and it seemed to help smooth it out. A subtle savor of yeast was buried deep within the taste to add just a dab more complexity. The mouthfeel was medium bodied. Slightly sharp and crisp with a lower carbonation. It became way more smooth as I went along and as I adjusted. A lot of flavor was left behind covering the palate after each sip too. Yeah, I thought this was a great beer to put it mildly. The aroma was “world class” in my opinion. The flavor was great, but it didn’t release the over the top sourness or tartness that some other Krieks have, yet enough was there to illicit a proper showing. 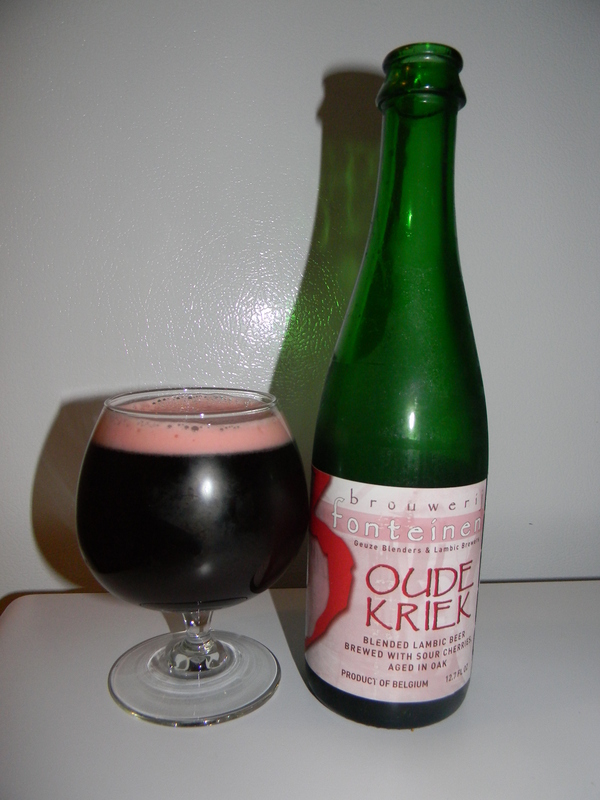 I would love to pick this up again for sure and I’d highly recommend you guys giving the Drie Fonteinen Oude Kriek a try if you happen to run across it and if you like Lambics. Be sure to let me know your opinion of it as well.